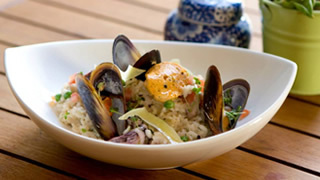 Paulina's Restaurant is situated on the Rickety Bridge Restaurant on the outskirts of Franschhoek Valley. Lunch at Paulina's might be over when the distant orange-pink mountains change their hue, but that doesn't mean you have to leave. At Paulina's Restaurant you can take a seat which overlooks the manicured Rickety Bridge vineyards. Sip a glassful of crisp estate wine and enjoy delicious lunch while drinking in the splendour of the magnificent surroundings of Franschhoek. Every creation from our team of selected chefs is given extra zest by the striking beauty of the setting and stunning views of the Franschhoek mountains. Paulina's Restaurant at Rickety Bridge is named in honour of the original owner of the property in 1797, Paulina de Villiers. In keeping with current culinary trends around the world, Paulina's Restaurant features a variety of half and full portions of its exciting bistro style menu, allowing diners the opportunity to sample and share dishes. The half portions are larger than a conventional tapas serving, so ideal for sharing or enjoying as a starter. Some of the dishes at Paulina's are served as main portions only. The restaurant spills out from a cosy thatched area onto decks with views over the vineyard and mountains. Umbrellas and a Bedouin tent provide cover and shade. Paulina's Restaurant is also a very popular venue for functions, including weddings.